Ensure your construction site is well lit up in the dark thanks to the portable tower lights we have stocked here at SGS. When you’re working outside at night, whether it’s at a festival, building site or any other purpose, site lights are essential to make working outside of daylight hours possible. For those in the trade, many of our products are great options as construction lights and building site lighting. Whatever the size, brand and type of generator you have, any of the tower lights will be suitable for many different uses. Have a look at the variety of generator lights for sale below. All of the generator lighting and each portable lighting tower available in our online collection is made in the UK by Stephill. The most compact and lightweight design possible means portable lighting towers can be easily moved around to wherever they need to be in use, as Stephill are a leader in their class. Pick up a Stephill lighting tower and/or portable generator lights that have been crafted with care and deliver a reliable light source. A lot of the generator lighting can be adjusted in height, can run for a long period of time and come with a two-year warranty. 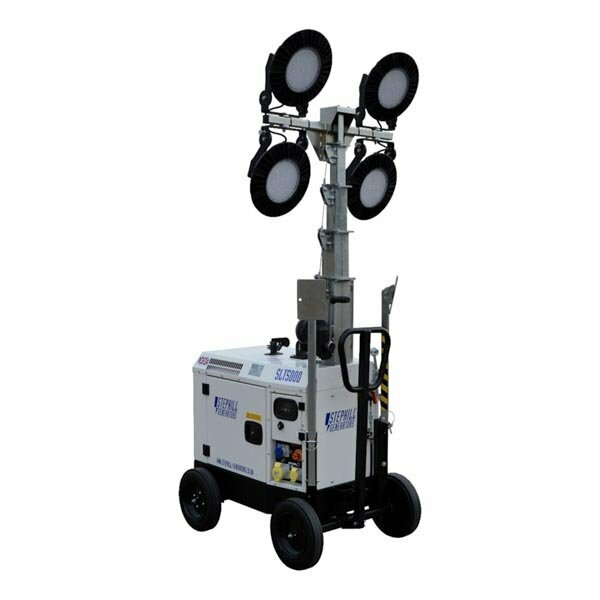 Browse all the lighting towers and portable generator lights available here at SGS and pick out the one for your needs. With so many different generator site and tower lights for sale on the market, choosing one can seem like a daunting task. However, with a few simple steps you can confidently select portable generator lights that will be appropriate for your requirements. We've put together these how-to guides to help you get started with our range of generators and mobile lighting towers.